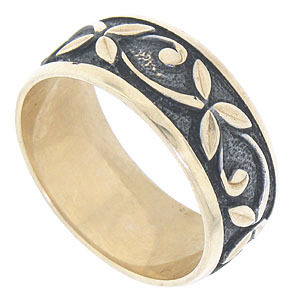 Polished golden vines and pointed leaves twirl across the face of this 14K yellow gold estate wedding band. The organic design appears to float above the rings darkened stippled surface. The outer edges of the band are polished smooth. The ring measures 7.90 mm in width. Circa: 1980. Size 6 3/4. Cannot be re-sized.